Rated 5 out of 5 stars by 8 PRO members. Antonov AN225-100. This version of the world's largest aircraft includes over two years worth of modifications and testing in comparison with the "real bird" data, and is the most realistic version offered for any flight simulation other than the real simulators for this aircraft, which do not exist. Everything has been tested and re-worked including all of the weight and ballance, engine characteristics, distance range, and many other detailed specifications. It includes high altitude realistic six engine contrails as well as cargo door opening and closing aspects detailed in the animations text file. It also includes a detailed kneeboard checklist and reference data as well as the realistic ATC callsign (ADB116F). Model and textures by Tom Ruth and Alex Kvitta. Sound by Mike Hambly and Riuji Ozawa. Flight dynamics and data corrections by Douglas E. Trapp. The An-225 is an extension of Antonov's earlier An-124. To meet the needs of its new role, fuselage barrel extensions were added fore and aft of the wings, which received root extensions. Two more Ivchenko Progress D-18T turbofan engines were added to the new wing roots, bringing the total to six, and an increased-capacity landing gear system with 32 wheels was designed. The An-124’s rear cargo door and ramp were removed to save weight, and the empennage was changed from a single vertical stabilizer to a twin tail with an oversized horizontal stabilizer. The twin tail was essential in order to enable the plane to carry very large and heavy external loads, which would otherwise disturb the aerodynamics of a conventional tail. Unlike the An-124, the An-225 was not intended for tactical airlifting and is not designed for short-field operation. With a maximum gross weight of 600 tonnes (1,322,760 lb), the An-225 remains as the world's heaviest and largest aircraft, being even bigger than the current double-decker Airbus A380 even though Airbus plans to pass their current maximum landing wieght with 591.7 tons (1,304,461.82 lb). The Hughes H-4 Hercules, known to most as the "Spruce Goose", had a greater wingspan and a greater overall height, but was considerably shorter, and due to the materials used in its construction, also lighter. In addition, the H-4 only flew once and never climbed above 21.3 m (70 ft), making the An-225 the largest aircraft in the world to take off multiple times. The An-225 is not only larger than the Airbus A380 airliner, it is also considerably bigger than the Antonov An-124, Boeing 747 Large Cargo Freighter, and Lockheed C-5 Galaxy, the nearest equivalent heavy airlifters. In September 2001, carrying a record load of 253.82 tons (559,571.572 lb) of cargo, the An-225 flew at an altitude of two kilometers (6,500 feet) over a closed circuit of 1,000 km (620 mi) at a speed of 763.2 kilometres per hour (474.2 mph). In November 2004, FAI placed the An-225 in the Guinness Book of Records for its 240 records. There is only one operational version of this aircraft in existance today, although one is still in mothballs awaiting funding and justifyable use of which most likely will be fitted with stronger engines (Rolls Royce RB211-524H-T, 60,600 lbf each) and will be likely dubbed the AN225-210. The archive an225det.zip has 126 files and directories contained within it. As a flight simulation fan, it always struck me that the largest aircraft ever made has ever really been taken on with any gusto. This was until I stumbled across this edition of the Antonov AN-225-100 for FSX, and to be honest I was quite blown away by just how accurate it was. Given the sheer size and scale of the task it’s no surprise that it took more than two years to build, but the end result is the most faithful recreation of the AN-225-100 ever seen in a flight simulator. While others might have tried to make it look excellent and really stand out from the crowd, it simply was something I’d never tried and truly felt as if I was flying such a magnificently important part of aviation history. This package, though, delivers this and more – it’s massively realistic and has been created with many modifications and additions over time, eventually creating a truly realistic product that stands out from the crowd. As a simulation fan I always want to see the most authentic features included and this makes an excellent job of doing just that, by including every possible prospect that can be included within the realms of the simulators limits. Every last detail from the speed it climbs at to the overall weight and size of the aircraft have been faithfully followed, making sure that your aircraft will feel as real as it possibly can. The attention to detail goes beyond just the feel of the aircraft, though. Inside and out it’s a truly resplendent take on this stunning piece of hardware as it gives every last part of the aircraft the attention it desires and deserves. 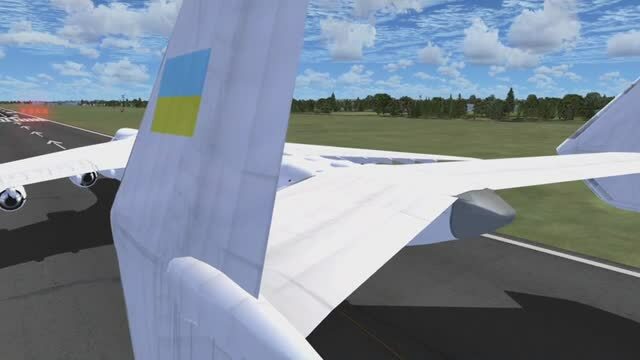 These extra additions and changes really make the Antonov AN-225-100 stand out and if you want to fly an aircraft that performs and feels totally different from anything else in the series, this is an ideal place to get started. At the time of writing, there is only one of these incredible aircraft in the skies and this means that you can get yourself a piece of genuine history. Not many people will have enjoyed being part of such a dynamic vehicle, so this can bring out some new experiences even for flight simulation veterans who feel like they have taken on just about everything they could! The attention to detail is so much better because the aircraft is such a rarity – it absolutely shines in comparison to many of its contemporaries, and looks absolutely astounding when you view it from the further away camera possible. The size difference is truly remarkable, and makes giving this a shot an interesting challenge for flight simulation fans around the world. Every little detail has been included to make you feel as if you are really in the actual one of a kind aircraft itself, and pays incredibly close attention to the small parts of the design that might not be needed, but finish it off perfectly. Tried downloading the AN225 but cannot install. What am I doing wrong? It is flyable in FSX, isn't it??? If you are wanting the VC, there is another varsion of this aircraft that I really like. It has a pretty VC, most of its in Russian though (you're still able to know what and where everything is). Heres the link, I'd highly recommend it. Nice plane flies great, any plans for a upgraded VC or panel? No VC, just 2-D cocpit from Boeing 747... Is anybody having the same problem?? I fly on BVATC online sever. Ever since I got this plane, I can't stop flying it. All my friends ask me how much I paid for it. It looks gorgeous on the outside and is a real challenge to fly, amazing airplane. This is an incredible AC, everything works, great special features (read instructions) and awesome to fly and screen capture. Even at night, lighting effects are great.